It's orange and it's coming for you! 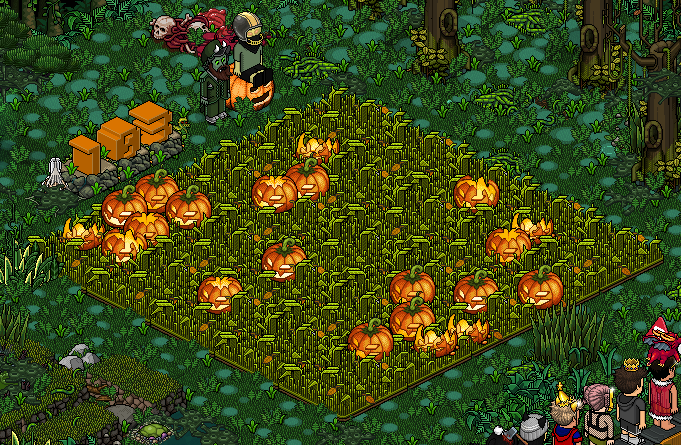 When the game starts, you have to survive for 100 seconds without getting trapped by the pumpkins. NOTE: Smashing pumpkins will help you not get trapped. Smash pumpkins by standing next to them (they will automatically begin to change state once they are next to you). If you die with a minmum of 100 points, you'll receive your badge. If you manage to smash every single pumpkin that is able to spawn in the game at least once, the candle shown below will light up. You will receive the secret badge upon losing the game if the candle is lit.